In coaching, the relationship is that of equals, partnered together to achieve agreed outcomes. 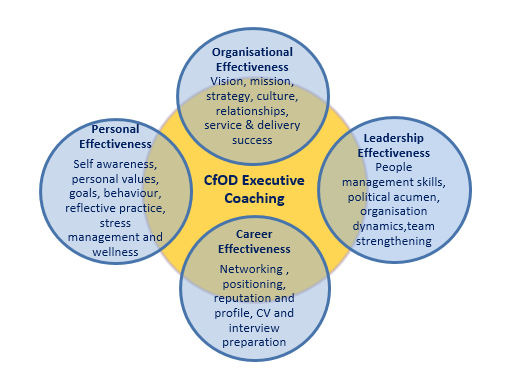 CfOD has one of the largest Executive Coaching and Mentoring practices in Australia. All our coaches have both social science qualifications and senior line management experience. CfOD’s National Coaching Bench has a reputation for coaching excellence. It provides coaching solutions to some of Australia’s largest organisations in both private and public sectors, and numerous individual executive coaching clients. Our team of accredited coaches represents a wealth of experience and understanding. They come from diverse backgrounds, each with expertise in specific work environments and organisational cultures. There are few people who wouldn’t benefit from a coaching relationship. It provides someone who takes time to listen and to guide you without any personal or political agenda other than you in the context of your organisation. Coaching will help you become aware of and realise your potential, providing a practical action plan for taking your performance to a higher level. On an organisational level, coaching programs are often required at a time of significant organisational growth or transition. Companies that implement coaching programs are rewarded by a more effective, committed and focused workforce; their employees are more likely to feel supported and motivated and remain loyal to the organisation, which has a significant positive impact on the achievement of corporate and business outcomes. In line with world’s best practice, the CfOD Coaching Bench benefits from the guidance of a Lead Coach (Mike Allen), who manages all aspects of our coaching programs. One of Mike’s roles is the crucial matching of coachee to coach to achieve the ‘right fit’ and ensure that you get the maximum benefit from your coaching program. Below are some of the coaching options we offer. All programs can be tailored to suit your individual or organisational needs. Executive Coaching: Executive coaching support leverages leadership skills and builds leadership capability through goal clarity, focused strategy implementation, problem solving, reflection and self–awareness. It provides an excellent, accelerated learning medium that supports individuals to implement personal and organisational changes. High Potential: Coaching for mid-level managers focuses on personal and professional development. The relationship with the coach is personal and outcomes are mutually agreed based on the particular development needs of the manager. Management Coaching: At lower levels in organisations, often what managers require is support in refining the application of newly developing skills and additional support in skill gap areas. Research shows that a professional coaching program will greatly assist in the integration and continuous learning process of individuals and their success. Team Coaching: Team Coaching differs from team development workshops or team interventions because coaching encourages the group to focus on solutions not problems and set goals and strategies to achieve them. Career Coaching and Planning: We offer a range of career coaching and career transition support service for executive, senior and middle managers including assistance with resume development and addressing key selection criteria and interview techniques giving the coachee opportunity to practice these skills through mock interviews. Ultimately our coaching methodology focuses on aligning and organisational goals to improve individual and team performance, organisational capability and personal effectiveness. Manager as Coach – Coaching provides managers enhanced self-awareness and balance, and transforms tacit knowledge of management into coaching. Our training sessions provide a framework of the Manager as Coach using a behavioural psychology approach which focuses on increasing performance and getting results. This model affords greater input from individuals, giving them a much clearer idea of organisational goals and developments. Managers who invest their teams with a coaching style of direction find that team members comes up with fresh insights, ideas and solutions, making the job as manager far easier and with far-reaching benefits in terms of professional and organisational development. Mentoring Programs - CfOD can provide a fully facilitated mentoring program, which will support both the mentees and the mentors throughout the entire program, whilst ensuring organisational outcomes as well. Working in partnership with your organisation, the program will lay the foundations for a more comprehensive mentoring service, with those engaged as mentees in the initial program prepared and equipped to mentor others in future programs. Mentoring is a personal and professional enhancement strategy, where one person (the mentor) facilitates the development of another (the mentee) by sharing known resources, experiences, values, skills, perspectives, attitudes and proficiencies, with the aim of building a depth of understanding to a range of mentee needs. Whilst the focus of the program is Mentee, both parties benefit from being able to identify and develop strengths, to develop skills, knowledge and attributes that assist in the attainment of meaningful goals. Invariably, achievement of these goals positively impacts both personal and professional domains for participants.